1 of 3 Bring a medium-size pot of salted water to a boil. Cook pasta according to package directions, about 12 minutes, reserving 1/4 cup of the pasta water. Add peas and red pepper to pasta pot for last 2 minutes of cook time. Drain pasta mixture and set aside. 2 of 3 Meanwhile, stir together cornstarch and 1 tablespoon water; set aside. Heat olive oil in a large nonstick skillet over medium-high heat. Add garlic, oregano and red pepper flakes and cook 1 minute. Stir in wine and bring to a boil. Cook for about 2 minutes, stirring occasionally. Stir in chicken broth and bring to a boil. Stir in cornstarch mixture and cook 2 minutes or until thickened. Stir in salt. 3 of 3 Add pasta mixture to skillet and stir together with sauce. 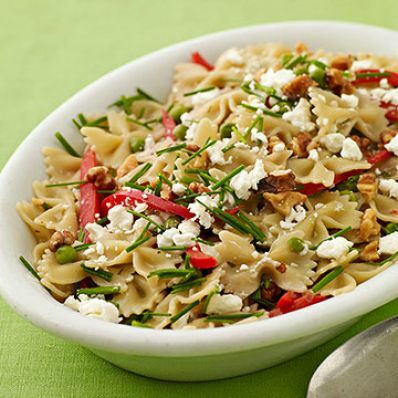 Stir in chives, walnuts and 1/4 cup of the goat cheese, adding pasta water by the tablespoonful if mixture appears dry. Sprinkle with remaining goat cheese. Serve immediately.